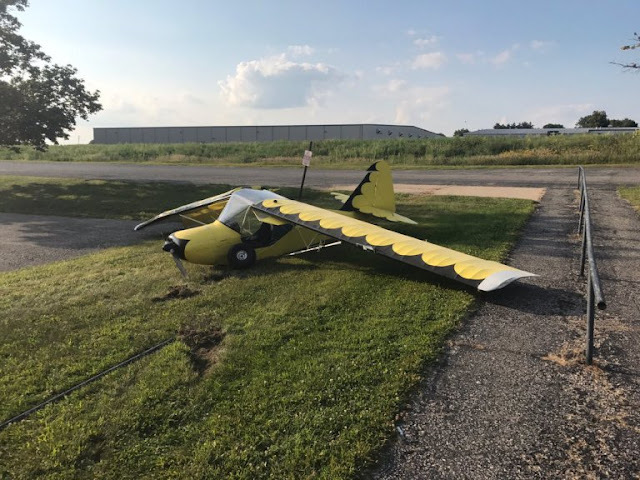 On August 14, 2017, at 1920 eastern daylight time, an amateur built Knapp Easy Raider airplane, N6862K, collided with a steel handrail during a forced landing in Rochester, Indiana, following a partial loss of engine power. The student pilot received minor injuries and the airplane was substantially damaged. The airplane was registered to and operated by the pilot as a 14 Code of Federal Regulations Part 91 personal flight. Visual flight rules conditions existed near the accident site at the time of the accident, and a flight plan had not been filed. The local flight was departing from the Fulton County Airport, (RCR), Rochester, Indiana, at the time of the accident. The pilot reported that the engine had recently been rebuilt and that he installed it in the airplane himself. The engine had a "couple" of hours of ground run-up time on it and the accident occurred on the first flight. The pilot was "crow-hopping" the airplane on the runway when he decided to takeoff. The pilot reported that upon reaching an altitude about 500 ft above the ground, the engine stopped responding to throttle control movements and the propeller continued to turn. Unable to maintain altitude, the pilot landed the airplane in a factory parking lot where it hit a steel handrail. A postaccident examination of the airframe and engine by a Federal Aviation Administration inspector did not reveal any reason for the loss of engine response. The temperature and dewpoint recorded at the Fort Wayne International Airport (FWA), Fort Wayne, Indiana, at 1954, was 79°C and 62.9°C respectively. According to the Federal Aviation Administration Special Airworthiness Information Bulletin (SAIB) CE-09-35 "Carburetor Icing Prevention" chart, the conditions were conducive for serious carburetor icing at glide power. On August 17, 2017, at 1920 eastern daylight time, an amateur built Knapp Easy Raider, N6862K, collided with a steel handrail during a forced landing in Rochester, Indiana, following a loss of engine power. The student pilot received minor injuries and the airplane was substantially damaged. The airplane was registered to and operated by the pilot as a 14 Code of Federal Regulations Part 91 personal flight. Visual flight rules conditions existed near the accident site at the time of the accident, and a flight plan had not been filed. The local flight was departing from the Fulton County Airport, (RCR), Rochester, Indiana, at the time of the accident. The pilot reported that the engine had recently been rebuilt and that he installed it in the airplane himself. The engine had a "couple" of hours of ground run-up time on it and the accident occurred on the first flight. He reported the engine stopped responding to throttle control movements shortly after becoming airborne. The pilot landed the airplane in a factory parking lot where it hit a steel handrail.